THE SPY WHO KNEW ME World Premiere — A.B.L.E. We are still glowing from the world premiere of our big feature film - The Spy Who Knew Me - on Saturday September 16th! This day was over a year in the making and we have SO many people to thank for making this project a reality. We launched our Hatchfund campaign to make this movie in March 2016, and were hard at work raising funds until June. Over 140 individual donations came in ranging from $1 to over $1000 from the US and abroad. Pre-production went throughout the summer as we firmed up locations, made costumes, and secured props and equipment. We spent a whirlwind two weeks filming in August 2016. (You can read our production logs from week 1 and week 2 on our blog). The Chicago community rallied around us, and we filmed at 11 locations all around the city. 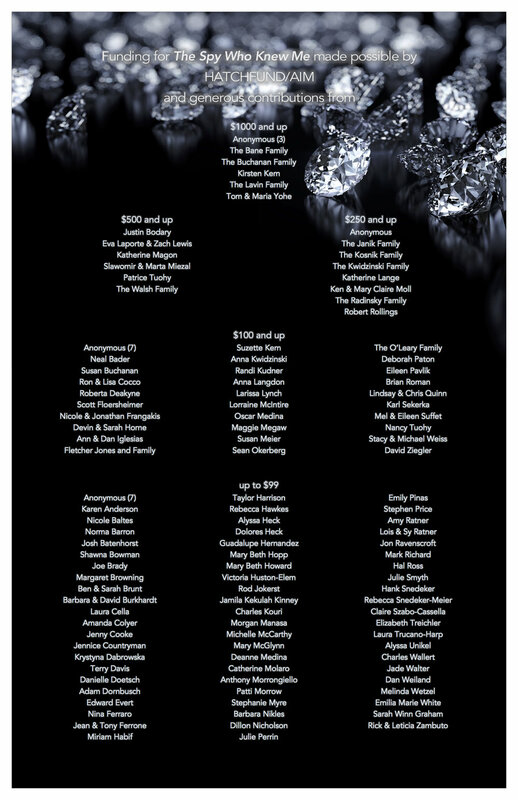 Check out our special thanks below to see all of the people who helped with pre-productions! The past year has been all about editing, which has been no easy feat. VFX designer, editor, and camera op Brock was holding down the fort in Chicago but the rest of our production team was spread far and wide. Executive Producer, Katie was in London. Writer/Director, Lawrence was splitting his time between LA and Austin. Director of Photography and Editor Andrew had a brand new baby and moved to Minnesota. Sound designer Alex was on tour with his band. We stayed in touch through the online platform Frame.io sharing drafts and notes, and had one big marathon editing session in June. We added in audio, including narration by Jessica Price and music by Carlos Villalobos, Jr. , and built in special effects and animation. This team worked hard all year and were so excited to share the finished product with friends, family. Scroll through to gallery to see photos from post-production. Finally the big day arrived and we gathered at Landmark Century Center Cinema for a special screening with our cast, crew, and supporters! Our volunteers arrived early to start setting up the theatre. Sean rolled out the red carpet (literally). Our fabulous volunteer Alison made decorations for the event including customized dossiers for each actor. Kendra organized our raffle and food stations. Lindsay made a collage of all our old show posters. Jenna manned the step and repeat taking photos as guests arrived. Peter, Matt, and Adele all helped with manual labor. We ran a test of the movie and then we were off! Scroll through the gallery to get a peek at set up. e had over 250 guests join us for the screening. Mostly family and friends of our cast and crew. Rachel brought a big group of colleagues from her class at National Luis University's PACE program to cheer her on. And former ensemble member Fletcher Jones came all the way from his new home in Arizona to see the movie. With popcorn in hand, we piled into the theatre to watch the movie. There was a lot of applause and cheering, laughter, and more than a few tears throughout. The film finished with a big standing ovation! Scroll through the gallery see some red carpet shots of our cast and crew or visit our Facebook page for even more! After the movie, we moved downstairs for a reception in suite #412 at Century Center. These offices also served as UNITE headquarters when we were filming. At the reception, guests could watch a behind the scenes slideshow with photos and videos from the set, purchase DVDs and posters from past ABLE performances, try on costumes and pose with props in our #SelfieStation, eat some delicious food donated by Chicago Bagel Authority, Homeslice, and Stan's Donuts. They also had a chance to enter our Super Secret Spy Sweepstakes raffle - for $5, entrants could claim a square on our banner. Three squares were randomly selected to win prizes - a 24x36 poster from the movie, a $25 Lou Malnati's gift card, and 2 complimentary tickets to Steppenwolf! Congrats to our raffle winners Quincy, Mila, and MJ! Everyone enjoyed mixing and mingling and talking about the film...although the donuts went way too fast! Sound recording made a huge difference for this film! Alex helped us with mics and onset sound so that we could fix a lot of the problems we had with Tempest Jewel and was fabulous with our actors. Catherine, Sean, Beth, Alison, Susan, Kaylie, Lindsay, and Becca wore many hats on set from dropping in to costuming to set design to boom operator. They are the greatest. We met Carlos during The Curse of the Tempest Jewel Carlos is a very talented musician who, in addition to his own music, frequently writes shows for film and TV like FOX's Empire. When he heard about our James-Bond-style movie, he handed us a whole hard-drive full of spy music free and clear. His soundtrack brings the movie to whole different level! We cannot say enough about our post-production team! Alex was onset with us for sound and in post-production, he mixed the soundtrack, made his own arrangements, did foley work and worked hard to cut out our TA and facilitator's voices and help our actors come through. Andrew and Brock poured through HOURS of raw footage and found the best moments from each actor. Andrew color corrected every scene. Brock built special effects and our awesome opening animation. These guys are the greatest and made this movie what it is. What's Next for The Spy Who Knew Me? At this time, we do not have DVDs of the film available. 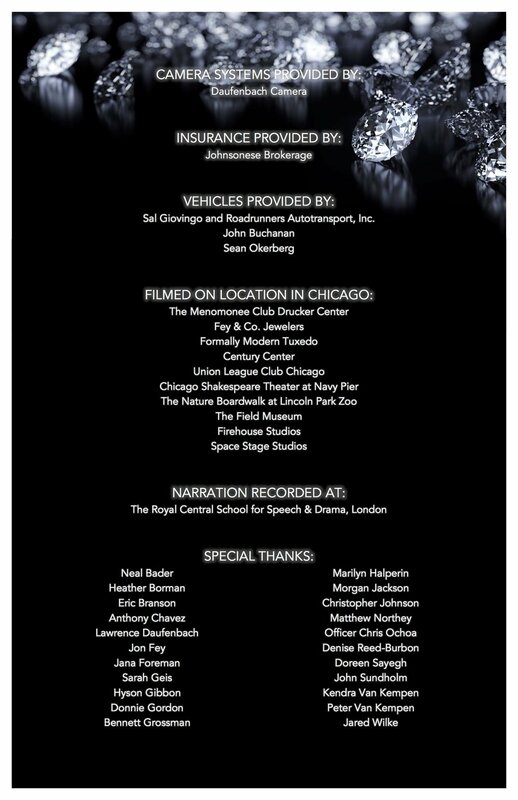 Hatchfund donors of $100 or more will receive a password protected version of the film to stream online as one of their donor perks. We'll be submitting to a few film festivals including Reelabilities, Sprout, The National Down Syndrome Society, The Chicago Onscreen Showcase, and some others (we're always looking for connections and suggestions). We also hope to share the movie at local screenings at schools and community centers. If you would like to arrange a screening for your group, click here to e-mail us. And be sure to follow our social media channels to find out about screening opportunities near you! THANK YOU, THANK YOU, THANK YOU to everyone who made The Spy Who Knew Me possible! Newer PostRehearsal Log: Week 2! Older PostRehearsal Log: Week 1!